As the demographics of college-going students continue to shift towards a more diverse population, the need for new perspectives in the recruitment and hiring of employees is becoming more prevalent. Universities and third-party providers are thinking seriously about how to better recruit, engage, and support the emerging populations of historically underrepresented students. The inclusion of new skills and perspectives in the workplace is offering organizations competitive strategies to help them thrive. These inclusive strategies are helping organizations increase participation, mitigate risk, and create innovative inclusive programming. The journey toward building a diverse and inclusive team is not a sprint, but more like a marathon. And National Career Development Month seems like an ideal time to begin training! So, on November 29, I will join with fellow panelists Lily Lopez-McGee and Chyvonne Gibson to host a special Collegial Conversation on Hiring for Diversity: Strategies to Strengthen Recruitment and Hiring Efforts. We will be touching on numerous topics about hiring for diversity during the Collegial Conversation, but we wanted to throw a few out there beforehand to get the conversation started. Most recruiters search for candidates in networks where they are most comfortable and familiar. During the Collegial Conversation we will share best practices for widening your search and collaborating on campus to tap into untapped networks. 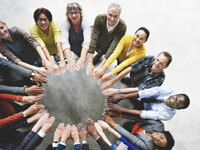 Diversity and inclusion in hiring is multidimensional. The days of simply checking off a box to describe who we are does not take into account our unique lived experiences and their intersections. Differences in ability, sexual orientation, socio-economic background, religion, age, race, ethnicity, and gender are all valuable to the success of an organization. A powerful commitment to inclusive practices in global education. You might encounter a candidate who has stellar experience engaging historically underrepresented diverse populations, brilliant presentation, organizational, and marketing skills. Perhaps participation in the NAFSA Diversity Impact Program will support their professional growth in the position. We hope you’ll join us on November 29 to discuss further! Aaron Bruce, PhD, is the diversity, inclusion, and equity officer at San Diego State University.